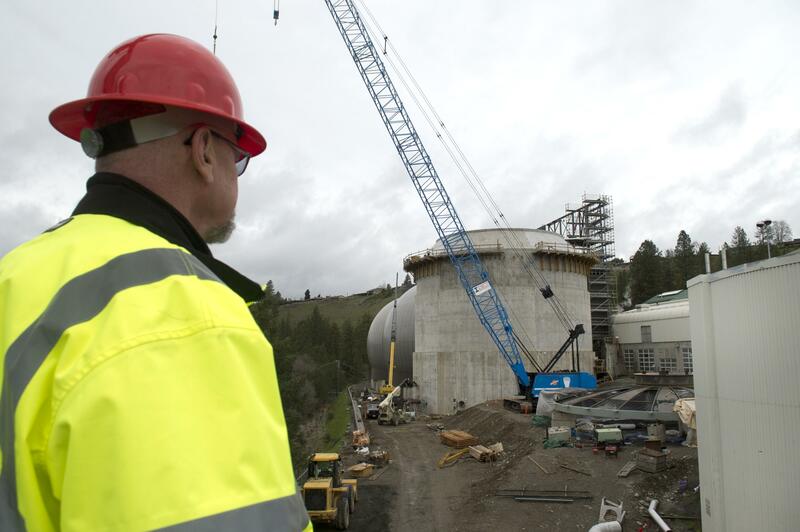 Tue., April 5, 2016, 7 p.m.
One of the biggest public works projects in Spokane’s history will begin this year with the construction of a $126 million addition to the city’s sewage plant. The next level of treatment being added to the Riverside Park Water Reclamation Facility will prevent nearly all phosphorus in the city’s wastewater and stormwater from entering the Spokane River. While the current system removes 90 percent of phosphorus, the next level of treatment will remove 99 percent of the chemical element, which is responsible for low oxygen levels and harmful algae blooms in the river and Long Lake. The filtration also will reduce the amount of heavy metals and polychlorinated biphenyls, or PCBs, going into the river. The work is part of the more than $300 million the city is investing in its Integrated Clean Water Plan, a massive retrofitting to the city’s water system that will stop most pollutants from entering the river. Other work includes updating the city’s stormwater and wastewater system, building huge underground holding tanks for stormwater and redesigning streets to prevent storm runoff from entering the water system. The new treatment process will use membrane technology, which can filter out minute pollutants too fine for the plant’s two other filtration systems. The new level of treatment will trap parasites, inorganic particles, bacteria, salts and other pollutants ranging in size from 0.1 to 0.043 microns. A human hair is typically 20 microns wide. The city is in the midst of testing two types of membranes, one of which will eventually be chosen. The two systems are very different – one uses enclosed canisters and the other one has open tanks – but Feist said they both filtered well enough for the city’s purposes. With the new filtration system, the city will be in compliance with standards set by the state Department of Ecology, allowing the water to be used for irrigation, industrial processes and recharging groundwater supplies. The city has no plans to sell the water for such uses, but instead will continue adding it to the river. Currently, the city is building a third digester at the facility at a cost of about $11 million. According to the city, digesters use a microbial process to break down the solids, oils and suspended particles removed from the wastewater. The solids remaining at the end of the process can be used as fertilizer, and the treatment plant generates about 6,500 tons of these biosolids annually. When complete, the city’s plant will be capable of filtering 50 million gallons a day. The facility likely can process up to that amount now, but the average processed is about 34 million gallons of sewage a day, Feist said. The new digester is needed to provide additional capacity at the plant and to provide regulatory redundancy. The other two digesters have been in operation since 2008. Bellevue-based MWH Construction and Slayden Construction Group, a joint venture, is managing the project for the city, the first time the city has used such a model. CH2M is designing the project. At least 50 percent of the membrane project has to be done by firms other than MWH. The city is discussing the work with potential subcontractors and will soon solicit bids. The work is funded by the city’s recent issuance of $200 million in green bonds, a new type of municipal loan intended for environmentally beneficial projects. Other dischargers subject to similar rules as Spokane are the Liberty Lake Sewer and Water District, Kaiser Aluminum and the Inland Empire Paper Co., a subsidiary of Cowles Co., which also owns The Spokesman-Review. Note: This story was changed on April 6, 2016 to correct the name of one of the dischargers, which is the Liberty Lake Sewer and Water District. Published: April 5, 2016, 7 p.m.